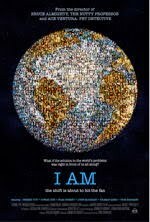 Yesterday I got free preview tickets to the movie I AM (warning: embedded YouTube starts immediately). I AM, a prismatic and probing exploration of our world, what’s wrong with it, and what we can do to make it better, represents Tom Shadyac’s first foray into non-fiction following a career as one of Hollywood’s leading comedy practitioners, with such successful titles as “Ace Ventura,” “Liar Liar,” and “Bruce Almighty” to his credit. I AM recounts what happened to the filmmaker after a cycling accident left him incapacitated, possibly for good. Though he ultimately recovered, he emerged a changed man. Disillusioned with life on the A-list, he sold his house, moved to a mobile home community, and decided to start life anew. Shadyac was there in person and fielded questions from the audience at the end of the screening. I suspended a lot of disbelief for this movie – notably for the emotionally receptive yogurt scene – and don’t feel I got a lot in return. While I want to congratulate the director for his personal epiphany and spiritual change, it seems incomplete. I’m sure the movie was made with the best intentions, but it comes off as a little narcissistic. It certainly is quite narrow in focus. The basic message is this: we need personal, spiritual change from being competition-oriented (and highly valuing competition to the point of “to the winner go the spoils”) to being cooperation-oriented. I agree with this main message, although I believe it is far too limited. The film spends a lot of time buttressing two main points: that (science tells us that) we as humans are “hard-wired” to co-operate and be empathetic to others, and that the bleeding edge of science tells us that the world is extremely interconnected. In other words, the claims from science are used to provide a space in which this very necessary revolution in values seems plausible. This would be easier if the presentation of the science itself were more plausible. For instance, right at the beginning of the movie are two whoppers: “People thought the world was flat until 1500 AD” and “People thought the earth was the center of the universe until the 5th century”. The first claim is utterly ridiculous. Columbus and his contemporaries knew the world was round: Columbus sailed West hoping to find a route to Asia and India. In fact, it took him a while to realize he had found a different continent; that’s why the Caribbean is referred to as the “West Indies”. Eratosthenes in the third century BCE not only proved that the Earth was round but estimated its circumference and axial tilt. The fact that the Earth is round is part of what gave the idea that it is the center of the universe such staying power. Aristotle’s cosmology placed the Earth as a stationary sphere in the center of the universe, surrounded by the planets on their own spheres, bounded by a large sphere embedded with stars that rotated about the Earth every 24 hours. This worldview remained dominant for almost two millennia, finally succumbing not in the fifth century but in the 16th, after Copernicus. You can find an excellent explanation of this profound shift in The Copernican Revolution, by Thomas S. Kuhn. As far as the science that was presented to address the movie’s main points, some of it seemed quite a bit too bleeding-edge and out-there. I can’t take seriously at this point the ideas that we act as receivers for other people’s hearts’ electromagnetic waves, or that yogurt can respond to our emotional state, or that electronic devices behave differently based on mass emotion (they claim random number generators got less random during disasters such as 9/11 or the Indonesian tsunami). Addressing the main points: yes, we as humans are hard-wired to cooperate, but we are also hard-wired to compete. Any real look at the world and how we’d like to change it must consider both and not dismiss either. As far as our interconnectedness goes, quantum mechanics tells us a lot of interesting things – or at least asks us a lot of interesting questions – but is in no position to really tell us anything about the interconnectedness of human to human, human to animal, or human in world. To understand that, you need a different kind of knowledge – mystical, poetic, spiritual, whatever. Many people, myself included, have experienced that kind of knowledge, but nobody’s learned it from a lab result or a textbook. The “quibbles” above are not just an artifact of a lack of historical fact-checking; they are indicative of how the movie seems to run on popular tropes and memes rather than really be a well-researched look at “what’s wrong with the world, and what we can do to make it better”. In particular, the movie, far from radically examining core assumptions of our society, actually adopts two of them. Number one is the high valuation of science. I won’t go into a lengthy critique of science here, but suffice to say that a) it is a discipline that is all about power and control (Francis Bacon: “knowledge is power”) and b) we cannot derive values, morals, or ethics from it. Science can tell us how the world is, but only outside science can we derive from that “what is wrong with the world”. Science is but one kind of knowledge, and it was distinctly surreal to watch a movie that was in a few brief moments mystical and poetic, and that exhorted us to a change of values, seek so pleadingly for scientific authority for its point of view. The other major irony is that although the movie claims to be advocating a major change in the thinking of Western society, it actually perpetuates the Achilles heel of that society: individualism. The claim is that it’s up to each one of us to change our views and our behavior – if only we did that, all would be better. The movie (and the director in the Q&A portion) repeatedly mentioned Martin Luther King, Jr. and Gandhi. But it’s important to note that those men were not just good people or spiritually enlightened individuals and that the respective movements were not just a bunch of good people. The civil rights movement and the movement for Indian independence were first and foremost movements: organized attempts by masses of people to fundamentally alter the power structures of society. And it is there that I AM most spectacularly fails. No other root cause for “what’s wrong with our world” is given besides our valorization of competition and our perception of being separated from each other and the world. Despite being based around a series of interviews with various writers and intellectuals, we don’t see much of that footage. It is striking that Noam Chomsky is on screen for only a few seconds. You know he didn’t present a picture of “what is wrong with the world” as being based on individual orientation. (The press kit for I AM contains more information about Chomsky than the movie itself, using phrases like “foreign policy” and “class warfare” that never surface during the film.) Howard Zinn gets some screen time, wherein he reminds us that every act, no matter how small, is important. He must have talked about the importance of mass movements – but nothing made the final cut. Shadyac claimed that if everyone had the right values, one could have “compassionate capitalism” and things would work out. People would give away what they don’t need. To anyone who’s given a little thought to how capitalism works, this is obvious nonsense. The capital for capitalism comes from profits: from “ripping people off – paying workers less than their labor value” as one audience member put it. Furthermore, capitalism is primarily about accumulation: thus it cannot function in a world in which everyone gives away that which they don’t need. There is a sickness that goes deeper than capitalism, and I have no doubt that a mass “revaluation of all values” must occur as part of the change we need. We need systemic, societal change, and we need individual, ethical change at the same time. We cannot have one without the other: this is a major way in which our world is more interconnected than most people realize. In this way, the message of this movie is fundamentally incomplete. For people who are only vaguely aware of the direness of our situation, or are particularly amenable to awareness from the “personal change” end of the spectrum, this movie might activate them and start them on their journey. But because, from what I can tell, Shadyac has really only started on this journey, this movie won’t be helpful to those farther advanced on the journey of personal change or who are more amenable to persuasion from the other end of the spectrum, which is not addressed at all. Now, as I discussed with a couple other audience members afterwards, it’s a bit unfair to criticize Shadyac for a loosey-goosey, happy liberal approach to politics. Some of us have thought about radical politics for years, even decades; he’s relatively new to thinking about “what’s wrong with the world” from that frame. It is my hope that he spends some more time exploring the other side of the change we need – the broad political picture – and that he really talks to and listens to more people. Perhaps in a couple of years we may see from him the film I had hoped this would be.